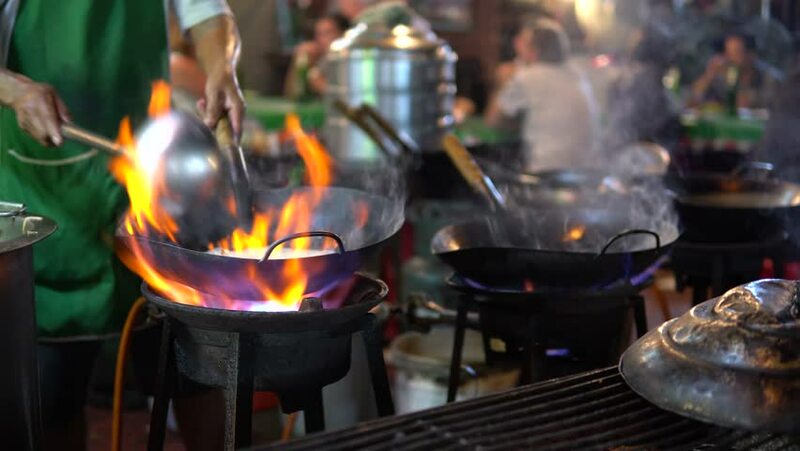 Chef cooking stir fried in a frying pan with chilli peppers,oyster sauce,oil on hot fire from gas in kitchen.Traditional Delicious Thai food.Business,healthy food concept. 4k00:09Bangkok, Thailand-January 5, 2019: Dining and seafood in Chinatown of Bangkok. Yaowarat Road (China Town) is famous for street food with lively environment. hd00:27Several cooks are cooking in the kitchen of a restaurant. They are using a wok that is used to saute the food by means of a constant movement denominated in the Chinese gastronomy like Wok hei. hd00:23chefs preparing and cooking food in a commercial kitchen. hd00:06Pulled pork being tossed in a low pan on a stove. hd00:11Xiangkhouang, Laos - NOVEMBER 18, 2015: The celebrations the ancestors of the Laotian in Xiangkhouang, Laos.